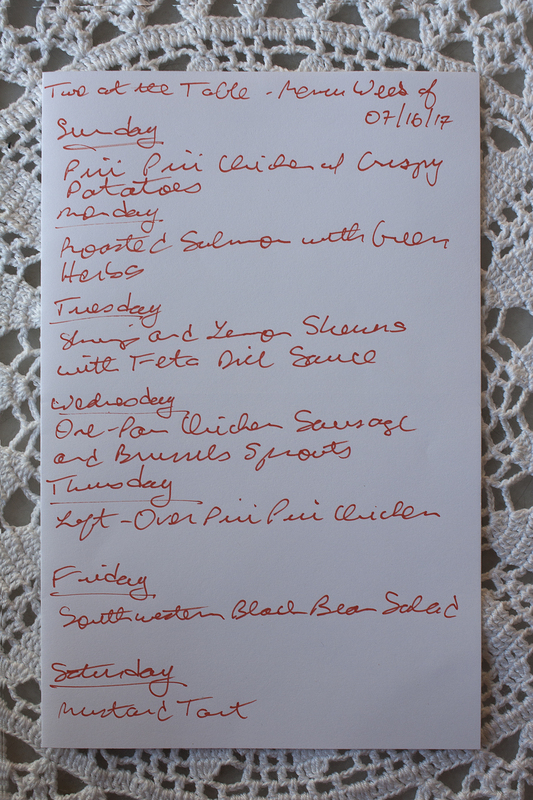 This week’s menu features a mix of old and new favorites, plus a few totally new recipes to mix things up. We’ll start the week off by making Food & Wine’s Piri Piri Chicken with Crispy Potatoes on Sunday evening. We made this once before and absolutely loved it. The piri piri sauce has an amazing depth of flavor with just enough heat to really perk things up. We’ll have this as leftovers on Thursday and we know from experience that both the chicken and potatoes reheat very well. We’ll make a salmon dish on Monday night: Ina Garten’s Roasted Salmon with Green Herbs. This is one of the very first dishes we ever made together, back when we were cooking in Kim’s old, tiny kitchen and not our own new, tiny kitchen. This is a very simple dish, but the mix of scallions, dill, and parsley that goes on top of the salmon is a wonderful combination. We’ll have a green salad on the side to round things out. Since we knew we would have plenty of dill around, we looked for another recipe that featured it prominently and remembered one we had made before: Food & Wine’s Shrimp and Lemon Skewers with Feta Dill Sauce. Our trusty cast iron grill pan will come in handy for this dish, as will our new metal skewers, which should eliminate the very real risks of putting wooden skewers so close to an open flame. We have some cucumbers left over from last week’s Greek Salad with Oregano-Roasted Salmon so we’ll work those into a salad to have on the side. We figured we might as well take advantage of all (or almost all) of our cast iron cookware and found a recipe that will let us use our larger cast iron skillet: Serious Eats’ One-Pan Chicken, Sausage and Brussels Sprouts. This very simple dish will make for a nice Wednesday night dinner and some tasty leftovers as well. We felt like making something different on Friday night and decided on Skinnytaste’s Southwestern Black Bean Salad. This is a pretty easy dish for a Friday night (or any night really) but it should be a nice way to wrap up the work week. We’ll add some protein to the salad to balance things out, but are not quite sure what that will be yet. We’ll probably see what we have in the freezer and go from there or maybe buy a piece of tuna on the way home and add that to the salad to mix things up. We have ballet tickets on Saturday night, so we’ll have a (somewhat) lighter dinner before the performance: Dorie Greenspan’s Mustard Tart, from Saveur magazine. We meant to make this dish several months ago, but we never found the time. It’s a bit labor intensive, but we’ll have all day to prepare it, so we should be able to figure it out!